Oil on panel, roughly 8 x 7 inches (21 x 17 cm). Link is to zoomable version on Google Art project; downloadable file on Wikimedia Commons; original is in the Kimbell Art Museum, Fort Worth. French 18th century master Jean-Baptiste-Siméon Chardin was noted for his still life paintings, and also for his genre paintings of figures in interiors (which also included still life objects). Though not in keeping with the majority of his other work, this subject of a student drawing is a theme Chardin returned to in multiple works. This painting is small, and in close up detail crops reveals itself as wonderfully painterly. Lines and Colors search: "Chardin"
Nice detail up close, with no other tourists elbowing me away from my view! I really like on how the student picked up the color range. Warm shades are very well combined and create a color unity painting color. I’m certainly not a professional, but just a writer of student papers, I can confidently say that this work impressed me. Thanks, Georg. Nice to know about, but it’s unfortunate there isn’t a larger image. The blog post is exciting. 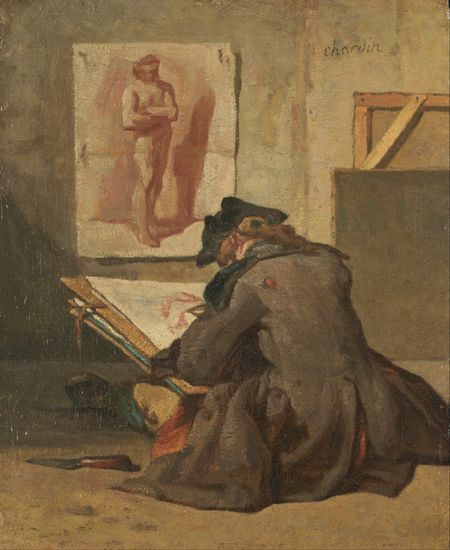 The article looks at the Eye Candy for Today: Chardin’s Young Student Drawing. The images show what the writer intends to deliver to the readers. It reveals that French 18th-century master Jean-Baptiste-Siméon Chardin was renowned for his still life paintings, and also for his various paintings of figures in interiors.